Three cute bear projects. The bear step stool measures 10" to the top of the step. 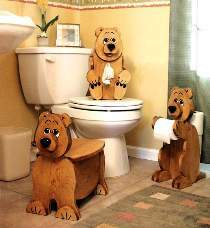 The bear tissue box cover holds the large size tissue box. The toilet paper holder has storage for three spare rolls in back. Patterns for all three projects are drawn FULL SIZE.